Hugonis with its powerful and austere style is the most prized product of Tenuta Rapitalà, the legacy wine. The seal of Hugonis Bernardi – a knight in armor with two leopards – which appears on the label, is the coat-of-arms of the family of Hugues Bernard de la Gatinais and his son, Laurent. Terroir: 100% estate-grown fruit is sourced from Nero d’Avola and Cabernet Sauvignon plots situated between 1,000 and 1,300 feet above sea level on rich, clay soils. Guyot-trained vines have limited yields of 28 quintals per acre. the wines are transferred to French oak barriques (50% new and 50% second and third passage) where they are left to mature for 18 months before being blended and bottled. The resulting wine rests in bottle for six months before release. Deep red color, full and complex bouquet with definite varietal notes, very well structured, abundant tannins and a long and lingering aftertaste. 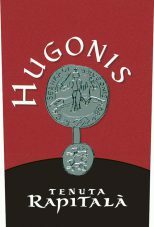 "The 2014 Hugonis is a blend of 50% Cabernet Sauvignon and 50% Nero d'Avola from an excellent vintage in Sicily. This is a darkly saturated wine with bold fruit layers and plenty of dark mulberry, blackberry, leather, spice, black olive and moist chewing tobacco. The wine shows ripeness, but there is careful balance here with bright layers of fruity acidity to brighten up the finish. This wine offers the soft and succulent structure of Cabernet Sauvignon with aromas that recall the warm summer breeze in Sicily that picks up aromas of wild fennel and sea salt. Some 8,000 bottles were made." Deep ruby. Ripe dark berries, plum, espresso coffee and oaky spices on the bright nose. Lush and open-knit, but with very good freshness to the savory black and blue fruit flavors. Smooth and broad on the finish, which features youthful, chewy tannins and a surprising light on its feet quality. Clean, fresh, long, savory and light on its feet. A blend of Nero dAvola and Cabernet Sauvignon that clocks in at 14.5% alcohol, but I wouldnt have said it tastes like it has quite those octanes.